No one denies that globalization has had a transformative effect on how business is done across the world. The process of globalization should ultimately lead to a world economy in which commercial transactions, trade in products and services, and the means by which cross border business is done is broadly guided by bilateral and multilateral agreements. However, that process is not yet complete, and the laws that impact cross border business continue to be found in national legal systems. Perhaps all nations are impacted, at least to some degree, by cross border commerce and investment, and it is commercial law — in large part, national in origin — that governs the environment in which such transactions take place. 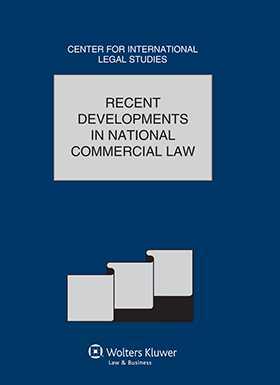 Thus, this special issue of the Comparative Law Yearbook provides a sampling of recent developments in commercial law in selected legal systems. Practitioners from Bangladesh, Canada, Colombia, Costa Rica, Germany, Mexico, Nigeria, Romania, Sweden, Switzerland, Turkey, and the United Kingdom offer their comments on developments in their respective countries. Colombia Ximena Chaves and Vanessa Gonzalez. Costa Rica Miguel Ruiz Herrera. Mexico Juan Francisco Torres Landa, Federico de Noriega Olea, Santiago Ferrer Pérez, and Hilda Alejandra Rodríguez Rico. Romania Cornel Popa and Anca Puscasu. Sweden Peder Hammarskiöld and Emil Nordin. United Kingdom Mark Williamson and Claire Davies.